Are these perks good for a Gas Trap? Unless you’re using a pusher/knockback trap of some sort (to loop the husks) it’s pointless to use any reload speed perks. You can see for yourself (in the screenshot) that your total cycle time on the trap by default is 9.0 seconds (8.0 reload, 1.0 arm). That means by default it’ll always be up and ready for every single wave and you can reasonably assume that any husk triggering the trap and within 1.5 tiles (where the trap is zero, adjacent is 1) of the trap will be hit by it within the next 4 seconds. 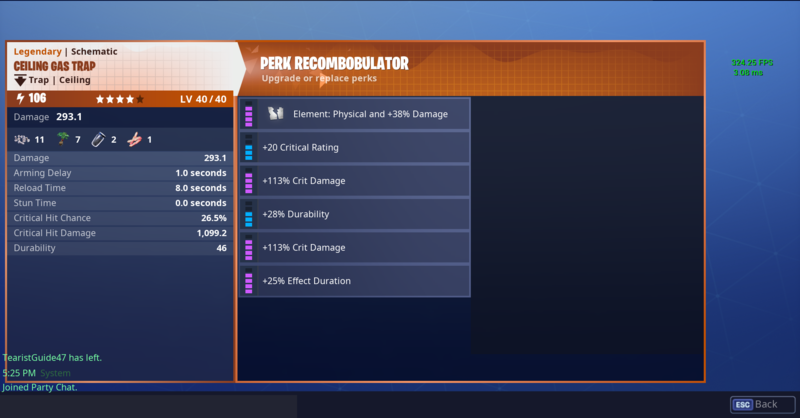 Whether you use crit or damage related perks (and how you combine them) will depend on what husks you’re trying to kill and the time in which they should die. If you absolutely must kill the fodder husks, no chances taken (in order to prevent them triggering more valuable traps) you’d skew more towards damage than crit (as an example).